BJP chief criticises party’s main rivals in TS for religion-based quotas. 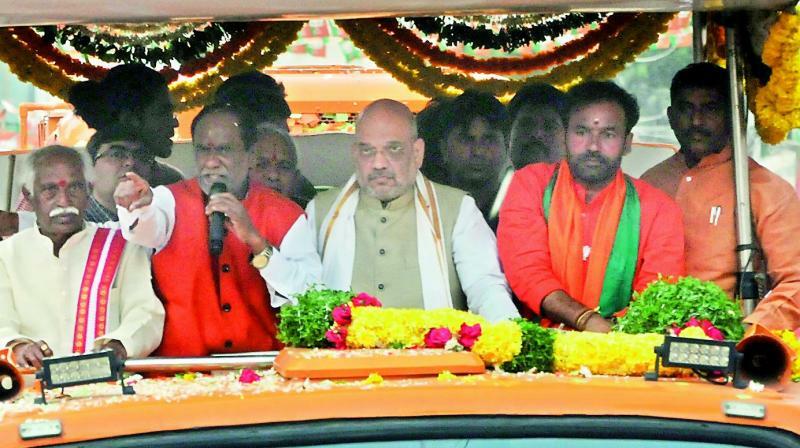 ADILABAD: BJP president Amit Shah on Wednesday came down heavily on the TRS and Congress for “appeasing the minorities” with exclusive welfare schemes and offering 12 per cent reservations. He said these days, the Congress was ahead of the TRS in appeasing the minorities. Addressing at a public meeting in Adilabad town as part of the BJP’s election campaign, Mr Shah claimed that the Congress led by “Rahul Baba” was reportedly going to offer reservations to minorities in contracts and special hospitals, Urdu teachers quota for minorities and Rs 20 lakh financial assistance for higher studies of minority students and free power supply to masjids and churches but not to Hindu temples. Mr Shah said the TRS and Congress were supporting illegal migrants from Bangladesh. He said an English news channel had leaked information regarding special schemes to be offered to minorities. He said whatever the Congress and TRS were doing to appease the minorities was against the Constitution and law. “Development of the people should not be based on their religion but on poverty,” he said. No one other than minorities will get contracts if the Congress manifesto was implemented. The people of other communities must learn Urdu language to get teacher jobs in schools, he said. Mr Shah claimed that former prime minister Manmohan Singh had said that minorities had a right on the the country’s budget resources, but Prime Minister Narendra Modi had said the poor had the right on Budget resources. That is the difference between the Congress and BJP towards development, he said. The BJP chief asked the people to support ‘Swabhiman Telangana’ and to fight against the MIM by bringing the BJP to power in the state.